Well folks. It’s official. We own a rental home. 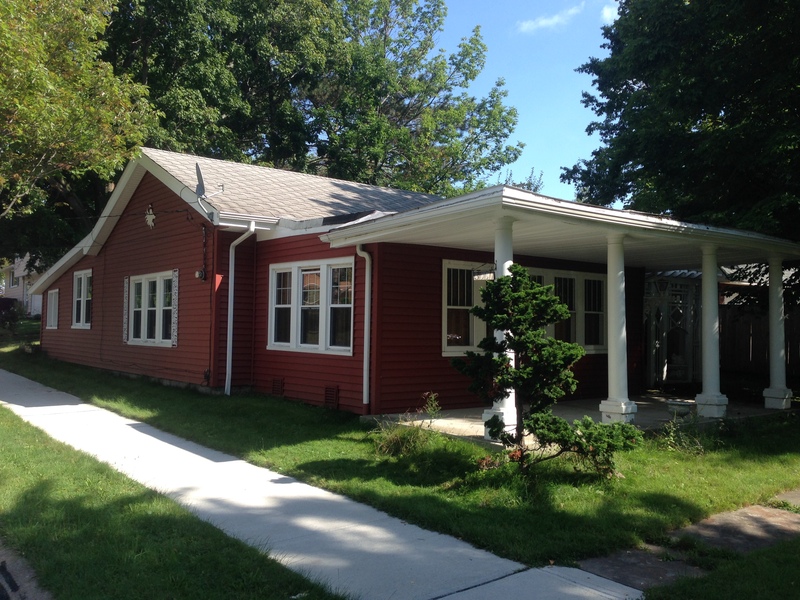 We were told the 1-bedroom bungalow-cottage was originally a garage but it’s an adorable little house with a ton of potential. While it needs a ton of work, we bought it for next to nothing so we have some money to put into it. We couldn’t do major work over the winter, but we did begin tearing out the drywall in the front room. Eventually, we will need to reframe some or all of these walls, which have been damaged from the pitch of the roof. Especially the right wall/windows in the photo below, which is completely rotted. Obviously, we need to rent a dumpster to start moving all this out (you would think we would have done that before we began tearing it up, but no, hubby got a little anxious). We also had several contractors quote the work we need to do on the roof. We need to re-shingle it, clearly, but the roof of the front porch slopes back towards the house, causing water to collect at the front left corner. 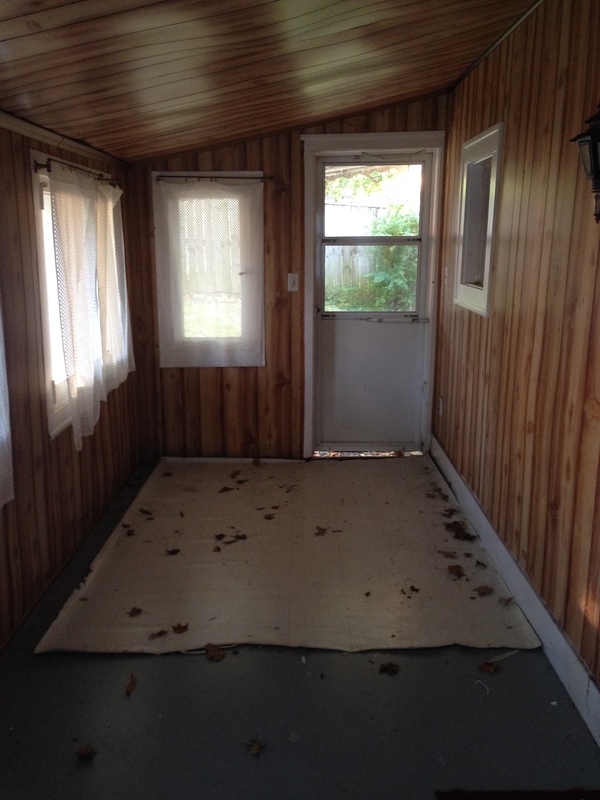 We are also going to rip out the back porch, which was built on the ground itself – no concrete foundation underneath the floor at all, and the roof was done poorly so the ceiling is rotted from water damage. It could probably collapse at any time…not good. The back porch door is the one on the right, which was being used as the main entrance to the house- the red door on the left opens up to the utility room which is just off the kitchen. 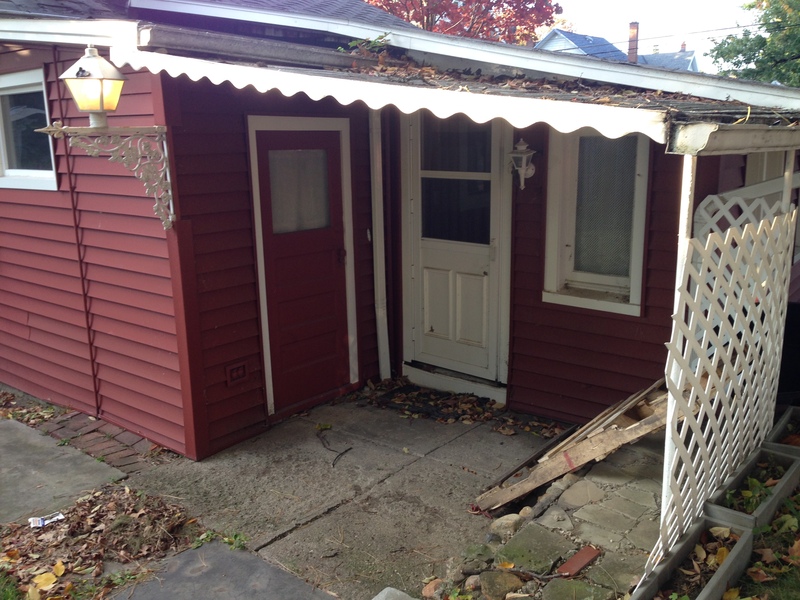 I think when we remove the porch, we’ll use the red door as the new entrance…giving the house a good size mudroom.